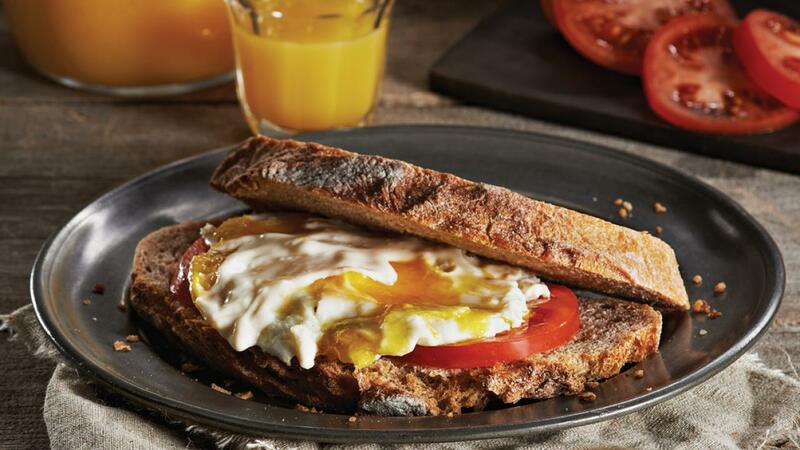 Curtis recommends these protein-packed sandwiches as a delicious start to one’s day, no matter whether it begins at sunrise or perhaps a little later. Place mayonnaise in small microwave-safe bowl; whisk in milk. Microwave on Medium (50% power) just until hot, about 45 seconds, stirring after 30 seconds. Whisk in Parmesan cheese, lemon juice and rind until smooth. Set sauce aside. Spray large non-stick skillet with cooking spray. Heat skillet over medium heat. Crack eggs into skillet. Break yolks with edge of spatula. Cook eggs to preferred doneness. Place tomato slices on 2 slices of bread. Top with fried egg. Spoon about 1 tbsp (15 mL) warm sauce over each egg. Cover with second slice of bread. The Parmesan cheese sauce can be made ahead and refrigerated. When ready to serve, warm briefly in microwave on Medium-High (75% power). Instead of sliced bread, use English muffins, kaisers or burger buns.